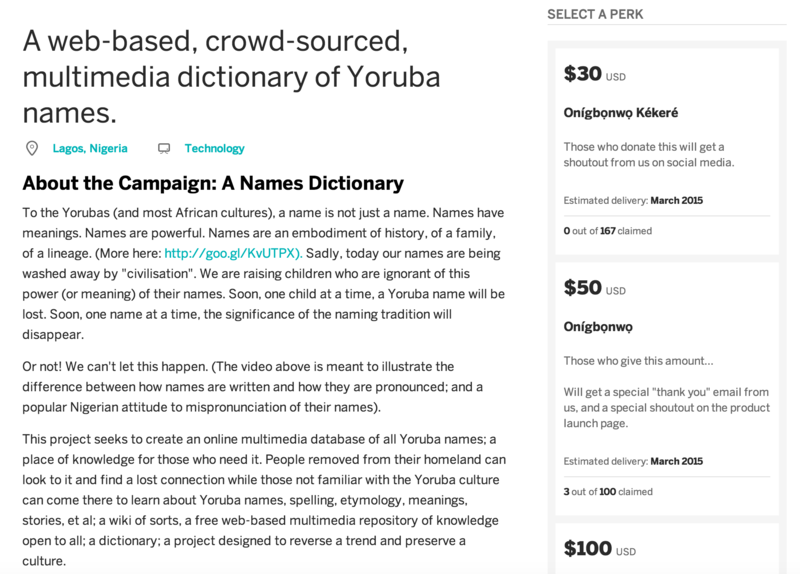 Nigerian teacher, linguist, and writer, Kola Tubosun is trying to raise $5000 for The Yoruba Names Dictionary project, a web-based, crowd-sourced, multimedia dictionary of Yoruba names. Like the Tweet Yoruba Project, which he led, this will be another contribution to the documentation (and eventual survival) of the language in the 21st century and beyond. Not just for Yoruba, but for indigenous languages everywhere. You can donate as low as $30 and as high as the entire sum needed to fund the project. There are two parts to this project. The first part is the initial database created from easily accessible sources: books, radio, television, internet publications, twitter, visitor logs, passenger manifests, etc. The second is the crowd-sourced entries created by users around the world, which will then be vetted by other users and by site administrators. These entries will then be edited for appropriate presentation, and an audio file added, among other things. These parts are equally important to the success of the project. ETYMOLOGY: Names will have links and information about its (ethnic and geographical) origin. MORPHOLOGICAL/PHONOLOGICAL INFORMATION: Like most dictionaries, this one will have relevant morphological and phonological/phonetic information. This will be of help to linguists and other academic users. AUDIO SOUNDS: Users will be able to click on names and hear the correct (and alternative) pronunciation. The sounds will be recorded by paid (or volunteer) voiceover artists. ALTERNATE SPELLINGS: Names that have alternative spellings will be highlighted. Abbreviated names (like “Lanre”, “Banke”, “Tunde” etc) will also be defined in full. SOURCE: Some names came from Arabic, Hausa, or European influences (names like “Bakare”, “Rasaki”, “Alimi”, “Buraimo”, etc). These will be highlighted with links and (web/audio/video) sources. STORIES: Some names carry more than what can be gleaned from their meaning. Users who know the stories related to their names will be able to edit entries in order to include it. OTHER RELEVANT CULTURAL INFORMATION will be provided, e.g songs from naming ceremonies, and other information of cultural value.